The Robert Bosch Center for Data Science and Artificial Intelligence (RBC-DSAI) was inaugurated at the Indian Institute of Technology (IIT) Madras or IITM today. 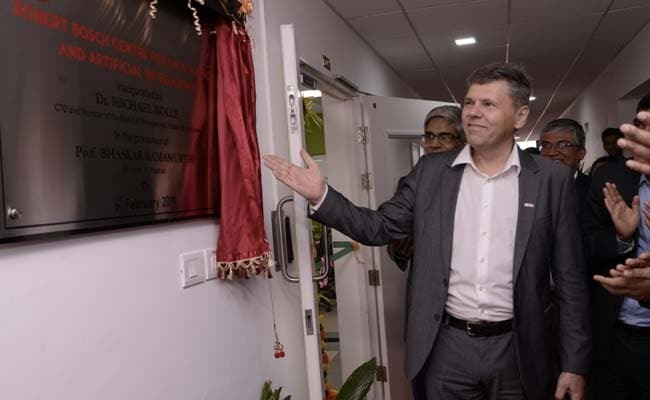 The Robert Bosch Center for Data Science and Artificial Intelligence (RBC-DSAI) was inaugurated at the Indian Institute of Technology (IIT) Madras or IITM today. Bosch, leading multinational engineering and electronics company, will invest 20 crores (2.5 million euros) over five years in the center. The mission of the new center is to create societal impact through multidisciplinary interactions with government, academic, research and industrial collaborators on core challenges in Data Science (DS) and Artificial Intelligence (AI), said a statement from the Institute. "Artificial Intelligence is a core technology for all areas of connected life - from connected mobility to buildings, factories, and cities. The expertise of our Indian engineers contributes to expanding the AI skills set of Bosch," said Dr. Michael Bolle, member of Bosch's board of management, during the opening ceremony. The RBC-DSAI will undertake foundational research in many areas of AI and Data Science, namely deep learning, reinforcement learning, network analytics, interpretable machine learning, and domain aware AI. The areas of activity include research projects, knowledge management and dissemination, outreach projects, and setting up collaborative facilities and laboratories. "The center's mandate requires interaction with industry and other universities, including international student and faculty exchanges. The objective is to advance scientific innovation for societal benefit," says Prof. Bhaskar Ramamurthi, Director, IIT Madras. Applied research will begin in four verticals: manufacturing analytics, financial analytics, smart cities, systems biology and health care. Several technologies currently require large datasets to improve their accuracy and to adapt these technologies for the Indian context. Prof. B. Ravindran, who heads RBC-DSAI, says, "The center, in addition to fundamental research, is setting out on an ambitious task of creating a portal of curated, India specific data sets that are easy to access and interpret through a set of open tools and interfaces."